The MSA V-Gard is worn by people on every continent of the globe and with a proven track record has become the helmet of choice for millions of workers all over the world. Whether you are in Buenos Aires, Argentina; Beijing, China; Sydney, Australia or Rome, Italy, you will always find the unmistakable silhouette of the MSA V-Gard on construction sites, power plants and factories wherever workers need reliable head protection from falling objects. 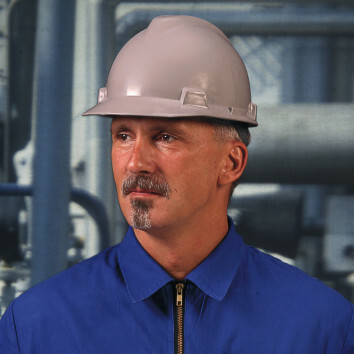 With experiences over many years in development and manufacturing of safety helmets and head/face protection systems, MSA has the ability to meet all your needs. Our programme of continuous development also means that we will continue to meet all your future needs, because we ask you. The popular V-Gard design in a High Density Polyethylene shell. Accepts the full range of MSA safety helmet accessories. Available in High Visibility fluorescent orange as well as the standard range of colours. A small size is also available. Certified to EN 397 and meeting optional requirements for electrical insulation and very low temperature. Premium Quality finish ABS moulded shell. High impact protection and chemical resistance. Superior fit and enhanced wearer comfort. Certified to EN397and meeting optional requirements for lateral deformation, electrical insulation, very low temperature. Peakless version of the premium quality Super V-Gard II. For use when unrestricted upward vision is important. Perfect for confined spaces, or any high level work. Fits very well under total encapsulating chemical suits. Lightweight and high strength helmet. For use when elevated temperature capability is needed. Protects from impact hazards and low-voltage levels. Certified to EN 397 and meeting optional requirements for lateral deformation, very low temperatures and molten metal splash.